ON THE GO OC - Things to do with your family. : Spend The Holidays at Five Crowns and SideDoor for a Tasty Treat! Spend The Holidays at Five Crowns and SideDoor for a Tasty Treat! Thanksgiving Reservations Now Open, Christmas Eve Reservations Open Nov. 23, 9 a.m.
Five Crowns and SideDoor invite you to celebrate the holidays like royalty with world-class seasonal menu offerings, warm hospitality and an unforgettable festive atmosphere throughout the holiday season. Reservations for Thanksgiving Day are currently available with seatings from 11 a.m. until close. The festive menu boasts the classic Oven Roasted Free Range Turkey with stuffing, mashed potatoes, gravy, buttered Blue Lake green beans, and housemade cranberry compote. Prime Rib of Beef is served in the traditional manner with au jus, Yorkshire pudding, organic whipped cream horseradish and choice of side. Indulge with the “Best of Both” for a portion of prime rib and side of turkey with all the seasonal accompaniments. Christmas Eve reservations will open to the public on November 23 at 9 a.m. and the holiday will offer seatings from 11 a.m. until close. In addition to the Prime Rib of Beef, Beef Steak Neptune, Seared Salmon and Prawn & Lobster Scampi, the menu presents the traditional Roasted Goose served with wild grains, mushroom, cherry, and Brussels sprout leaves. A Royal Feast holiday children’s menu is available for kids 12 years old and younger and offers junior portions of signature entrees. Perfect for the kids! Love this.... A to-go option too! 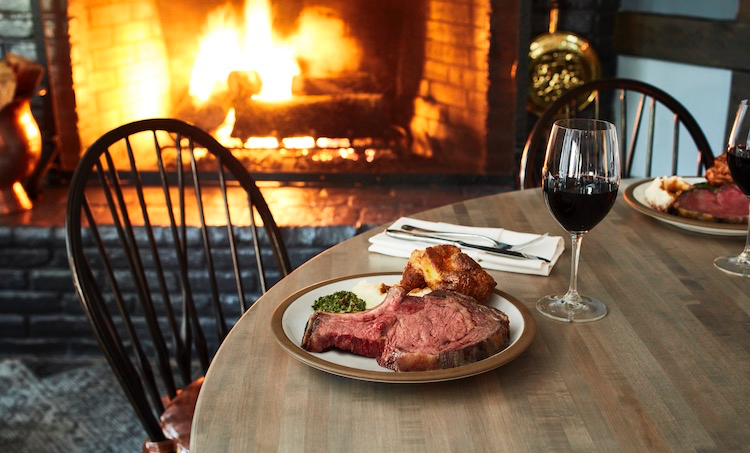 For those spending the holidays at home, Five Crowns offers the traditional prime rib dinner to-go. Select from a bountiful feast menu with roasted Prime Rib of Beef, classic accompaniments, sides and desserts to compliment the perfect seasonal celebration. Beginning November 30, carolers will roam through Five Crowns and SideDoor, performing nightly serenading guests with classic jingles. The cozy dining and private rooms will be enhanced with holiday décor, twinkling lights and crackling fireplaces, exuding the spirit of the holidays. The restaurants can be transformed to accommodate the most extravagant holiday events for hundreds of guests, or individual rooms cater to more intimate gatherings for family and friends. Five Crowns was established in 1965 and is a member of the Lawry’s family of fine-dining restaurants, which includes Lawry’s The Prime Rib with locations in Beverly Hills, Chicago, Dallas, Las Vegas, Tokyo, Singapore, Taipei, Hong Kong, Osaka and Seoul and the Tam O’Shanter in Los Angeles. Lawry’s Carvery, with locations in South Coast Plaza, Costa Mesa, and at L.A. LIVE, Los Angeles, represents the company’s unique quick-service concept. SideDoor gastropub, recipient of Orange Coast Magazine’s “2010 Restaurant of the Year” Award, is also housed within the historic Five Crowns building; its primary entrance is on Poppy Street. Five Crowns and SideDoor are located at 3801 East Coast Highway, Corona del Mar, CA, 92625. Valet parking is available. For Five Crowns reservations, please call (949) 760-0331. To make a reservation at SideDoor, please call (949) 717-4322. For more information visit http://lawrysonline.com/five-crowns, @fivecrownsrestaurant http://sidedoorcdm.com, @sidedoorcdm .